Since the heavily publicized hardships of the mid-to-late 2000s, Michigan has enjoyed an incredible economic recovery. This has been the case not just in Detroit, but across places like Auburn Hills, Bloomfield Hills, and towns that don’t even have “Hills” in their name, like Troy! Now, the economy is very much back on its feet again, and thriving. There are plenty of statistics to back this up, of course, but really you only need to drive around those aforementioned places to get an idea for how well they’re doing. New businesses are popping up all the time, and there’s plenty of construction going on seemingly everywhere you turn. If you’re one of the enterprising people involved in all this exciting construction work, then – firstly – congratulations! That’s a pretty good business to be in! Secondly, though, we’d also like to talk to you about an excellent way to protect your investment, and ensure the greatest possible return on it – post construction window cleaning. With everything that’s involved in constructing a new building, it can be pretty hard to focus on the details. That’s perfectly understandable, of course, but these details really are incredibly important. They can play a large part in determining how much money you make from your building, and even whether you’re able to sell or rent it out at all. Post construction window cleaning – whether you’re in Troy, Detroit, Auburn Hills or Bloomfield Hills – is a perfect example of this. With so much on your mind during the construction phase, and then even more on your mind when it comes to renting or selling that space, it’s a classic detail that can be forgotten. That would be a big mistake, however. You might not notice those new windows looking worse for wear, but you can bet your bottom dollar that a first-time visitor will. Dirty windows might not be enough to put them off the property entirely, but they will definitely create a negative impression. On a subconscious level, they make the space seem less desirable, and a less appealing place to work in. When there is so much money on the line, we have to ask… why take the chance of this happening? That question is particularly relevant because it is so, so easy to get those windows looking perfectly clean! In fact, post construction window cleaning is one of our specialist services here at J&M Window Cleaning. We’ve successfully carried it out on innumerable buildings here in Michigan – whether in Detroit, Auburn Hills, Troy or Bloomfield Hills – and we’ve consistently achieved excellent results. Specifically, we’ve been able to clear those windows of all kinds of unwanted substances, including paint, dust, silicon and stickers. In very little time at all, we’ve gotten those windows looking as good as new again… which they are, of course! This has helped to give the entire commercial space a clean, bright and welcoming atmosphere, which in turn has helped our clients to rent or sell their properties more easily. Sounds pretty good, right? Well, it is! In fact, we’d say that – if you’re looking to market a commercial space – post construction window cleaning is an absolute “must”. 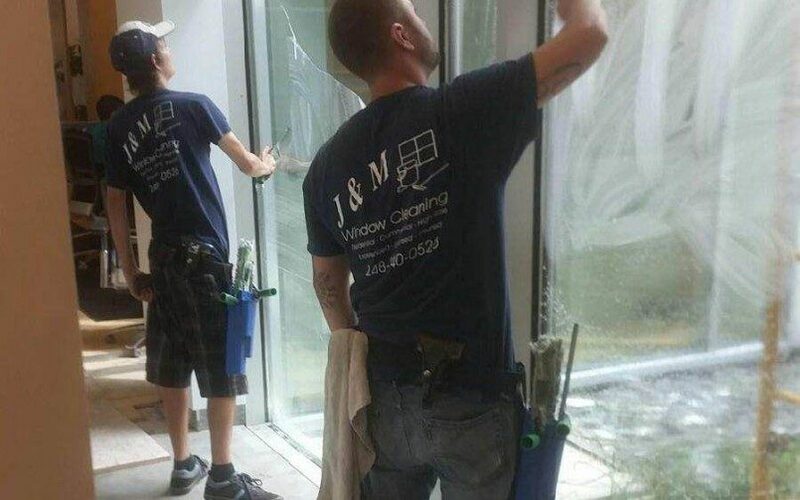 If you’d like to make an enquiry today, simply get in touch with us here at J&M Window Cleaning by calling (248) 605-2243, or emailing CleanWindows@JMWindowCleaning.com.